Welcome to the island of Kagejima and the Kingdom of the Moon. Build a team from six mighty clans, each with its own strategies and traditions on how to walk the ninja's path. Employ all of your skill and strategy to survive the Moon Princess's challenges and emerge victorious against your rivals. Guide the growth of your team and prove it worthy of serving the Moon Princess as protectors of Kagejima. 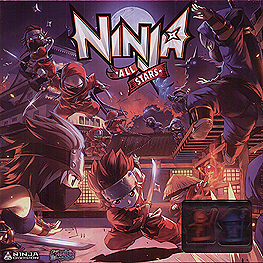 In Ninja All-Stars, 2-4 players compete in a series of challenges. Between games, ninja earn experience to gain new abilities and combat aptitudes. Ninja All-Stars features stunning, fully assembled Soda Pop miniatures and exciting community-driving, league-style gameplay. Build a team of elite ninja and compete for honour and glory.